Hey, I get to write a new blog post for today’s April Platform Challenge! It’s a sound excuse to get all us wannabe writers to, well, actually write something. As always, Robert has a creative twist; include a call to action at the end of the post. Why? Well, to interact with our readership, or course! In my case, all 20 or so of you. Buckle up, we’re headed to the future. A friend of mine from the dawn of time commented in a previous post that I hadn’t changed all that much in 30 years (aside from massive hair loss). I like to think that I’m better looking, or at least smarter, but I fear he is correct. It started with some news that I got today. Way back in 1977, when dinosaurs roamed the Earth and Neanderthals that roamed the shopping malls (without benefit of cell service, mind you) got into fist fights when gasoline hit $1.00 a gallon (I’m serious, it’s like they had no self control), a young game designer out of Austin, Texas created a “MicroGame” called “OGRE”, about giant, cybernetic tanks and the world war between the Combine, Paneuropean, China and Nihon forces began. It’s been going on for 35 years! I played my first game to pieces. Then, I bought a second and played it to pieces. There was a whole slew of these types of MicroGames (“A minute to learn, a lifetime to master”); the absolutely fabulous “The Fantasy Trip” series, the “CarWars” series, and with the ORGE series, there were numerous supplements, “GEV” and “Battlesuit” (although purists spurn the inclusion of “Battlesuit”, I’m keeping in here because it was in the same universe). I spent hours on these games. Then, I got older. I noticed that girls really didn’t care about my boss Mark VI design and my swooping GEV attack waves. No, seriously, they didn’t care. Boggles the mind, doesn’t it? So, I boxed the games up and they, in a fit of pique, shipped themselves to the island of misfit toys. I know I didn’t throw them out! In the 80’s, several of the fledgling PC platforms had computer versions of OGRE, but it wasn’t the same. A little later, ORGE miniatures came out and I fell back in love again. I purchased the miniatures, but I just couldn’t find the time to play the games anymore. Mostly, because I let the day job interfere [shakes fist at sky]. You’re wondering about the news, yes? Well, today I found out the Steve Jackson has a Kickstarter project to produce a limited run, Designer’s Edition of the classic game. I won’t go into all the details, but it is similar to the Gold editions of Monopoly that came out a few years back. I’m excited about Steve’s willingness to run this out of Kickstarter, but I suppose that it makes good business sense. For those that participate, they’ll get what they are willing to pay for. 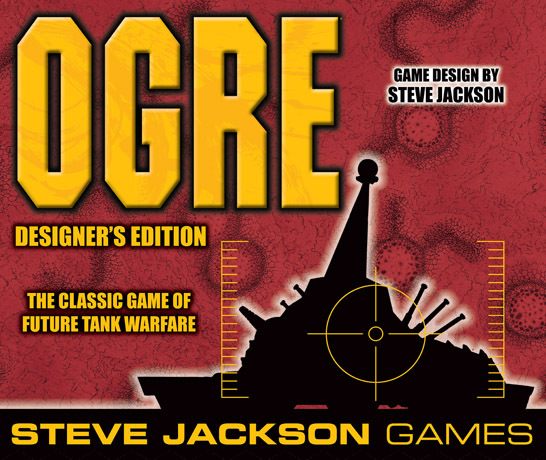 If you fondly remember those games, check out the OGRE Kickstarter site, or the OGRE page at Steve Jackson Games.